First, watch the above video. It is a step-by-step demonstration narrating how to access your student's CANVAS courses/dashboard. 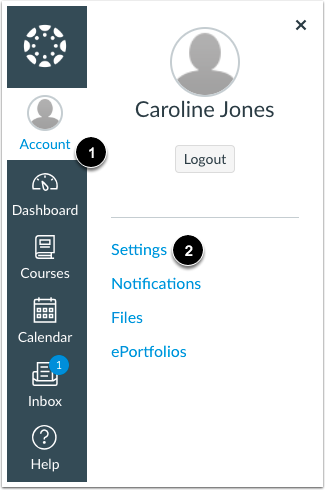 Once you are in your student's CANVAS account, you can observe, in real time, his/her grades, assignments, feedback, discussions, and announcements. It's like being in the classroom with your student. Your parent loves you and wants to be part of your academic experience. We're excited to break down some barriers and really include them in the exciting things happening for your as a Knight in your academics. 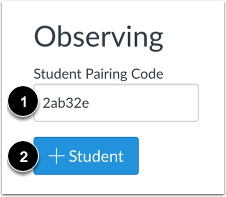 As a student, you can generate a pairing code to link an observer to your Canvas account. 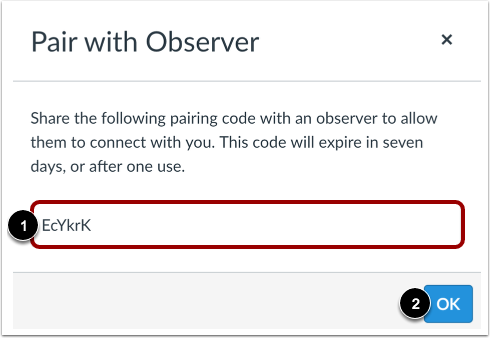 You must create a separate pairing code for each observer who wants to link to your account. For more information on pairing codes, view the Pairing Codes - Frequently Asked Questions PDF. An observer may be your parent, guardian, mentor, counselor, or another individual who needs to view your Canvas courses. 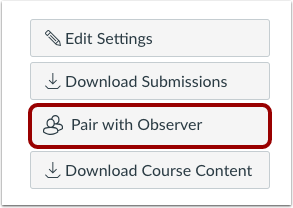 Linked observers can can view and participate in certain elements of your Canvas courses. For more information on the observer role, view the Observer Visibility and Participation PDF. 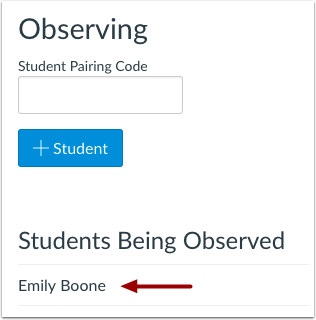 If you are an observer and want to generate a pairing code for a student, you will need to log in to the student’s Canvas account and follow the steps in this lesson. 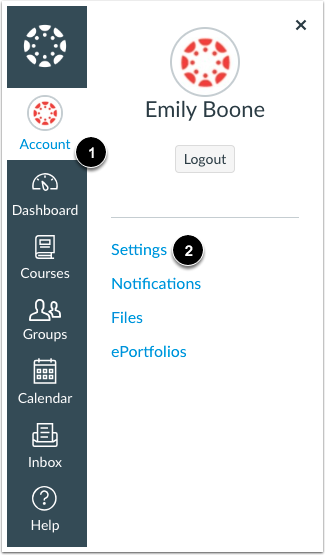 After you have copied the pairing code, you can link to the student by entering the code in your User Settings. Pairing codes can only be generated in a web browser. Click the Pair with Observer button. Copy the six-digit alphanumeric pairing code . You will need to share the code with the observer who will link to your account. The pairing code will expire after seven days or its first use. To close the window, click the OK button . Note: Pairing codes are case sensitive. First of all, as a teacher, we want to say “thank you” for being a student’s or students’ personal academic cheerleader. Classrooms are not the same without you. Teachers can plan, adjust, collaborate, and differentiate with their greatest efforts, but you are incredibly valuable to the learning process. You help fill in gaps in understanding and sometimes you re-explain tough topics. You are another amazing caring adult who can assist a student - or two or three...or more - become strong, intrinsically motivated, and self-advocating learners. Again, thank you for being involved, and bravo for using Canvas to make the process more efficient! As an Observer, you have access to a lot of great information, and, at first, it can be challenging to navigate the information efficiently' this is especially true if you are actively monitoring the progress of more than one student. Just remember, it's like any new tech -- eventually this will become second nature. From a web browser (and/or the app on a device), after you set up your Observer account, you need to connect to your student or students (How do I link a student to my user account?). It is possible to follow all of your students under a single Observer sign-in. I have just a small note about how to link multiple accounts to a single observer: the best place to link additional children is through the browser. Have your pairing codes ready, and then repeat the process you completed for your first student. The resulting connections will work seamlessly wherever you sign-in. 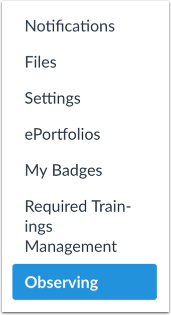 However, depending on how many students you follow and how many courses your students are enrolled, the dashboard can become overwhelming. As an Observer, you have a unique perspective of the learning that occurs within the Canvas-based classrooms of your student or students! If you have more questions or ideas on how to improve the Observer experience, please contribute to Q & A and Canvas Studio to keep the conversation going. If you have watched the video and followed the step-by-step directions but still are having issues accessing CANVAS or have CANVAS questions, please reach out to our Director of Technology, Brian Stark.